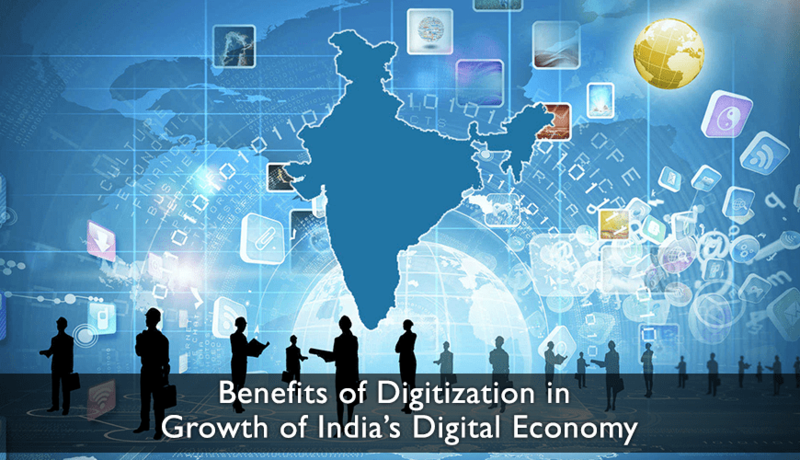 Benefits of Digitization in Growth of India’s Digital Economy - GBIM Technologies Pvt. Ltd.
India has about 46 million internet users and this number is expected to increase by 7 to 8 percent. India therefore represents a growth economy that offers a large market potential for global players. The internet economy, which is also referred to as the digital revolution is expected to generate new opportunities for market growth and jobs. It is also expected that the digital revolution will create many opportunities for businesses in the next thirty to forty years. India has provided leadership and shown promise in the use of digital technologies over the past ten years. It is now time for India’s leaders to fuel and support the digital economy in order to turn it into a vital growth enabler. Prime Minister Narendra Modi’s launch of Digital India is welcome. The objective of this program is to connect the rural areas with high speed internet and to improve digital literacy. The digital revolution has already begun taking place in India. The vision of a digital India has already brought about inclusive growth in the areas of manufacturing, electronic services, and job opportunities. ∙ The opportunity of every citizen to use digital infrastructure. ∙ The introduction of digital payments, which make it possible to bring the unbanked on-board. app and platforms such as UPI-integration are making it easier for people to transfer money. India is also one of the leading counties when it comes to the evolution of payment systems. Enablers such as Aadhaar, Jan Dhan, Mobile penetration and demonetization have made it easier for many people to adopt digital payment systems. Due to mass adoption of biometric and digital systems, India is expected to use plastic payment systems on a large scale and have one of the most sophisticated financial systems in the world. India is aspiring to be a leader in different global technology platforms. This is strengthened by the country’s expanding technology capabilities, vibrant private sector, rich diplomatic history and entrepreneurial potential. In order for India to maintain its leadership in information technology, it is vital for digital technologies to be used to improve public services, deliver financial inclusion and develop efficient trade mechanisms. It is possible to achieve this by leveraging the information technology competencies of India technology companies and skilled personnel in the country. The goal should be to deliver advanced digital solution for the problems India faces and make a difference to the economy. One of the IT companies that are making a difference in India is GBIM Technologies Pvt Ltd.